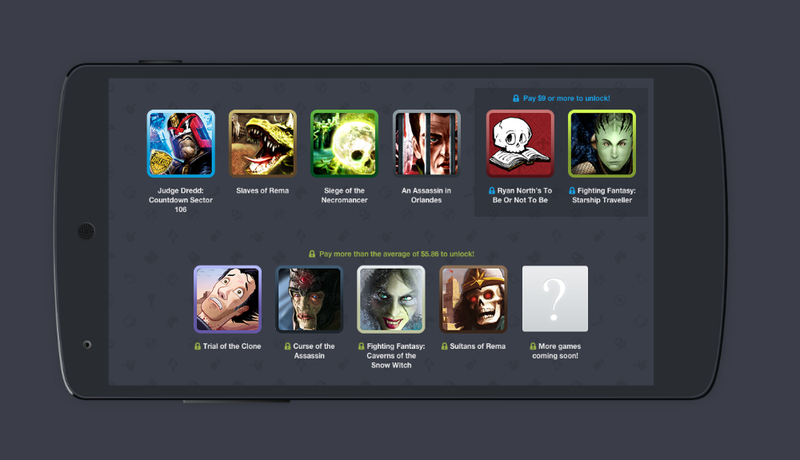 A new bundle of games is available through Humble Bundle, this time made in partnership with Tin Man Games. They are the creators of a few titles on Google Play, such as Judge Dredd, To Be Or Not To Be, House of Hell, Bloodbones, and many more. In the Humble Bundle, you can pay what you want for Judge Dredd, Slaves of Rema, Siege of the Necromancer, and An Assassin in Orlandes, but if you pay more than the average, which is currently under $6, you also get Trial of the Clone, Curse of the Assassin, Fighting Fantasy: Caverns of the Snow Witch, and Sultans of Rema. If you pay more than $9, you get all of the aforementioned games, plus To Be Or Not To Be, plus Fighting Fantasy: Starship Traveller. That is a whole lot of games for a little bit of cash. For those feeling extra generous, if you pay $35 or more, you also get a Tin Man Bundle t-shirt, as well as a button. Feel free to go check out the Humble Bundle, and also support couple of great charities.